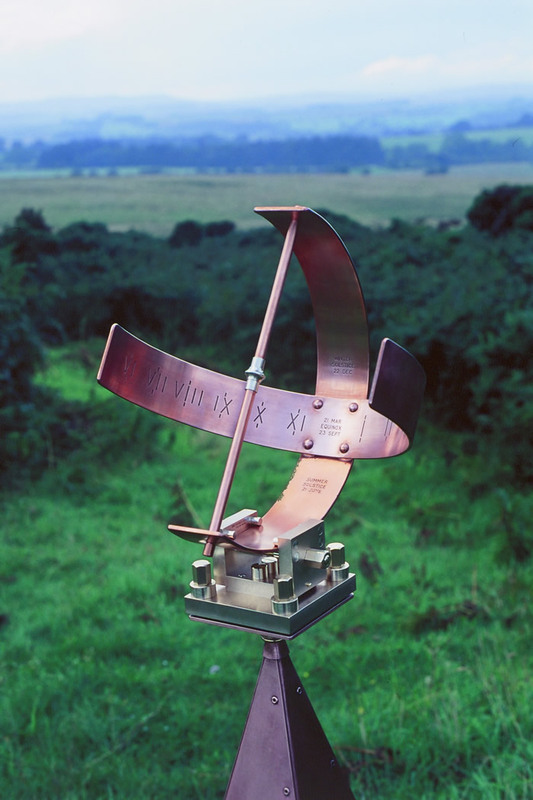 This sundial functions beautifully as a garden sculpture, a gift to celebrate a Birthday or Anniversary or a Memorial to a loved one. 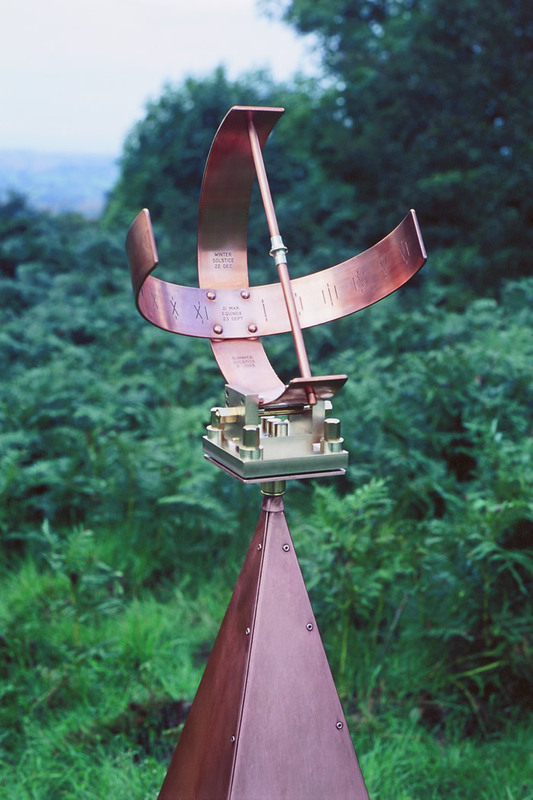 This sundial has tremendous "presence" in any garden, my training and experience of over 35 years tells me I've produced a really good design that has a timeless quality. Something that in 50 years time will still have that just made feel to it. The arrangement of the basic elements of the design has that "rightness" about it that is very satisfying, functioning perfectly as a finely engineered piece of sculpture. I only make these as and when required, strictly to order. The dial can be purchased individually, or with the wall mounting should you so require. This design fits in well with any style of garden. This design has been painstakingly developed and fine tuned, every part made completely by me to my own exacting engineering tolerances. Great care is taken with each dial which is beautifully hand finished to museum standard. 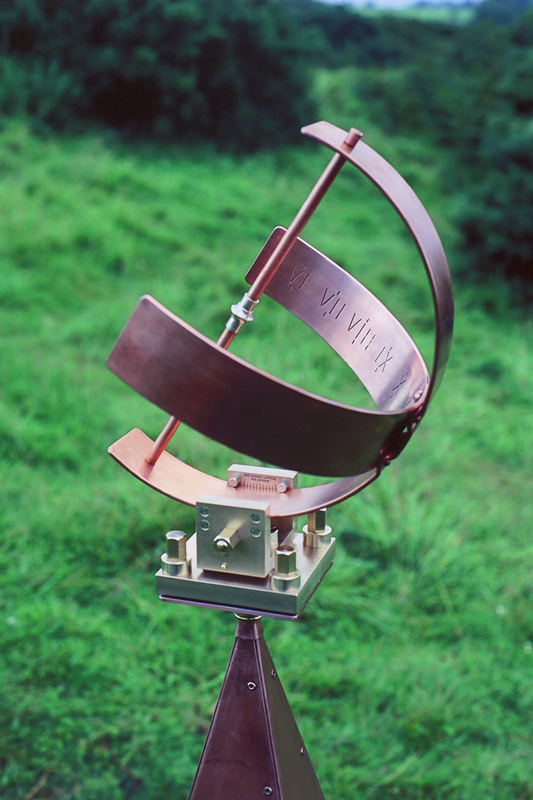 Materials used include C101 copper for the circular scales and Naval brass for for the adjustable latitude mounting. Nowadays Naval brass costs much more, in years gone by was standard Admiralty spec. due to it's superior corrosion resistance. Patents have been applied for, for the circular joint and adjustable mounting. I have a very good engraving machine, so a simple inscription/dedication can be easily fitted on to the 2" x 1" area between the two front custom made mounting bolts. The hand turned nickel silver gnomon bobbin indicates both the solstices and equinox at noon, as engraved on the vertical scale. 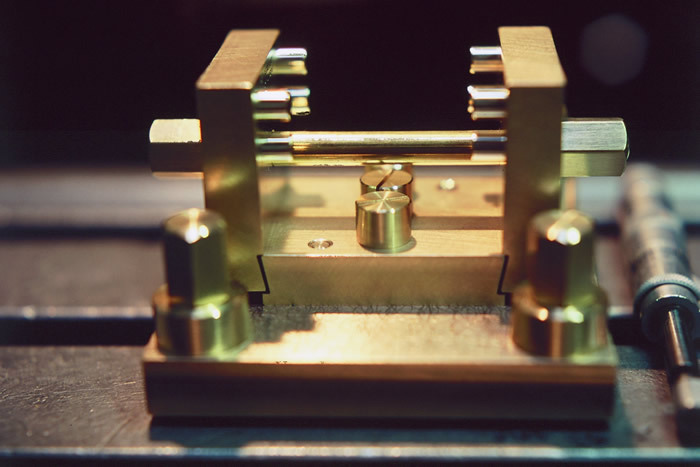 The inner face of the base side clamping block is engraved in degrees allowing the dial to be re-aligned for a new location of latitude should you ever move home. An easy way to remember the orientation of the circular gnomon rod (the bit which casts the shadow) is that on the equator it is horizontal and at the North Pole it is vertical. The intersection of the two ten inch diameter circular scales incorporates a very clever piece of toolmaking. 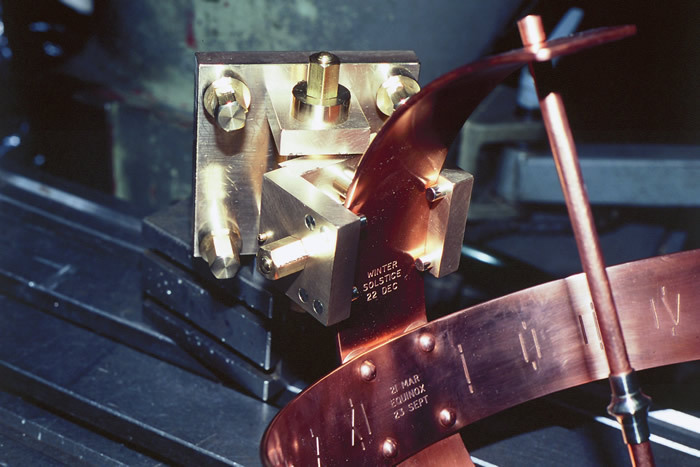 I devised a special purpose press tool to conform the vertical scale to the geometry of the horizontal scale, resulting in a very robust joint. The Naval brass hexagonal nuts and thick section washers can cope with a great length variation in the mounting bolts, 6mm threads. As part of the package I supply the four bolts, the spanner to fit them and a custom drill jig, including the carbide drill, which has the four holes very accurately pitched at 3 inch centres. I also include a guide to installation. The combined weight of the dial and mounting is 4kg, i.e. 8 1/2 lbs. My price for the dial to fit your own base is £3,000.00 GBP, the adjustable wall mounting is £546 GBP. obelisk no longer available. If you are resident in the EU, v.a.t. will be added to the invoice total, vat rate at time of despatch, otherwise no purchase tax to pay for my overseas customers. To give my customers the utmost security, I'll issue an invoice from your written order, payment by wire transfer on my IBAN is fine, or I can accept a personal dollar, euro or sterling cheque. When the money is cleared I'll despatch by UPS Carriage is between four and eight percent depending upon UK, Europe or a North American destination, this being added to the invoice at time of despatch. My good name and reputation ensures you receive a first class service. ***I'm sorry to say my Sundials are no longer available.